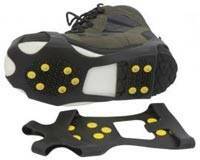 These ingenious Wader-Grips, can be used on any waders or wading boots, to give additional grip on slippery surfaces, whether algae covered rocks, dam walls or even ice! Simply fasten the Wader-Grips to your boots, for instant, extra grip. 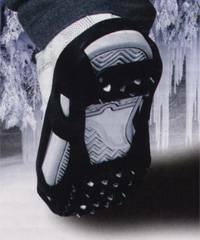 The thermoplastic rubber material is highly elastic, so they will stretch to fit a wide range of boot sizes. Ideal for anyone who has to walk long distances to their fishing, so wants cleated soles, but then requires extra grip in the river or reservoir bank, or rocky shoreline. Each Wader-Grip is fitted with 10 hardened carbon steel studs, for extra grip. Size: L  for all waders or boots up to size 11. Thick felt soles are made from tight fibre 100% polyester felt. The simple solution to the problem of storing and drying waders or wellies; correct storage will also extend the life of your waders. Stores two pairs at a time. Rugged polypropylene construction. Screws to garage or tackle room wall with screws provided. 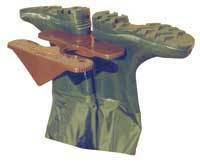 Waders or Wellies are easily removed with this well made, practical Boot Jack. 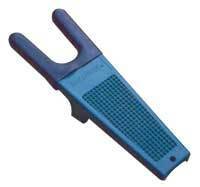 Rugged polypropylene construction with rubberised jaws for extra grip. Keep one in the car boot for easy wader removal on the bankside. Tough, replacement laces for our Wading Boots and being long laces, suitable for Hiking Boots too. A pair of tough rot-proof laces to fit all Vision wading boots.